You can connect your Google Account by logging in with your Google credentials. You'll then see your Google Calendar entries in your Impulse timeline, helping you to easily track your time. 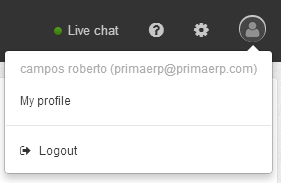 This connection is read only (from primaERP you cannot change your Google entries) and your data won´t be accessible to no one but you. Because we take your privacy seriously, this connection requires only the necessary data. Moreover you can disconnect your Google account at any time. A) Click on your avatar icon, which is located at the top right side of the main menu. C) Select the "Security " tab. D) You will then see the list of external services that could be synchronized with primaERP TIME TRACKING. E) In the Google section, click on the "Connect" button. F) A pop-up window will open, requesting access to your Google account. Accept it. Because Google establishes short sync periods, we recommend allowing pop-up windows in your browser. 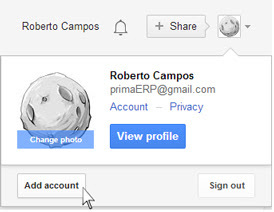 This way primaERP will reconnect automatically with your Google account in order to avoid common issues. G) As soon as it is connected, you will see the name of your Google account. Note that primaERP and Google will use this information in accordance with their respective terms of service and privacy policies. 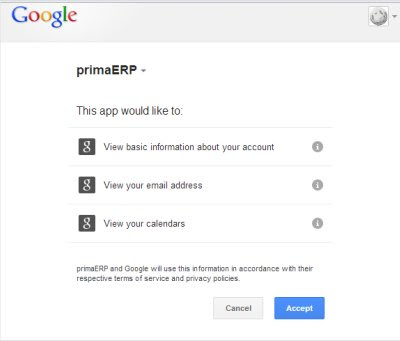 Step 2: Configuring primaERP - This step allows you to display the entries of your Google Calendar in the Impulses panel. A) Click on "Settings", which is located at the top right side of the screen. B) Select "TIME TRACKING settings" in the sub-menu. C) Select the "Impulses" tab. D) In the Google Calendar section, press "SHOW". E) There will appear a Calendar button, click there and select the Calendar to be synchronized. 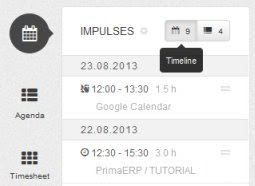 Finally you´ll see your Google Calendar entries in the Impulse timeline. Because impulses relate to retrospective information, you will only see entries from the current and previous days. B) Select "TIME TRACKING settings" on the sub-menu. D) In the Google Calendar section, you will see "number of displayed days back". Click on the button and select the number of days you would like to see. The connection with remote services can be cancelled at any time. E) In the Google section, you will see a button with the name of your Google account, click on it. Note that disconnecting your Google Calendar account will not affect the time records already created. This ensures the reliability of the information registered in primaERP. This process is to be followed only in case the user experiences common issues. D) You will see the list of external services that could be synchronized with primaERP TIME TRACKING. Need to reconnect after log in. The Google Calendar connection is lost suddenly. The information in the Impulses panel doesn’t match the current view of the Google Calendar. The Impulses from Google Calendar disappear. A) Allow pop-up windows: Take into consideration that according to the Google privacy policies, this sync has a limited period, therefore the connection should be refreshed from time to time. Allowing the pop-up windows will grant the option for primaERP to refresh the connection automatically. B) Stay signed in to Google: As soon as you sign out of your Google account, which you used to connect with primaERP, or switch to a different Google account, the connection between the applications will be lost. If you have several Google accounts, we recommend adding an account instead of switching the account.